All GRAS microphone preamplifiers are based on a small ceramic thick-film substrate with a very high input impedance. The ceramic substrate is shielded by a guard ring to minimise the influence of stray capacitance and microphonic interference. The casing is made of stainless steel for maximum strength and durability. The small dimensions of the 26AH ensures reliable operation under humid conditions owing to the heat generated by internal power dissipation. 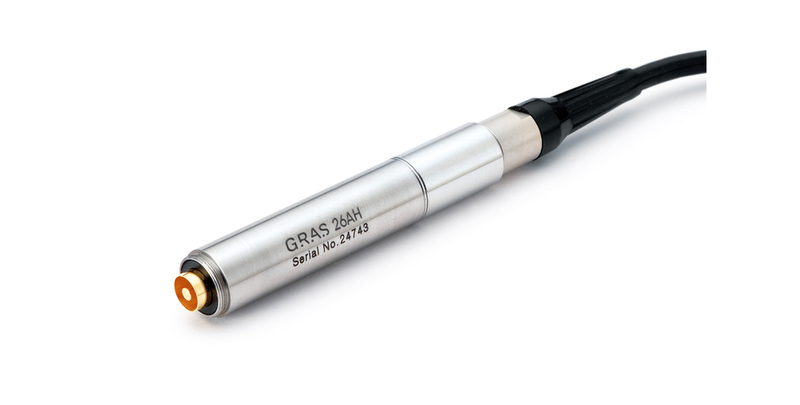 GRAS 26AH has SysCheck for easy remote verification of the measurement chain. It allows you to send a test signal to an RC network in the preamplifier. This signal is applied to pin 1 of the 7-pin LEMO cable/connector. SysCheck does not result in a signal proportional to the microphone’s sensitivity, but it gives you a way to determine whether your system is stable. SysCheck cannot replace a proper acoustic calibration of the microphone. The preamplifier is compatible with ½-inch microphones as defined in international standard IEC1094 Measurement Microphones, Part 4: Specifications for working standard microphones. The mounting thread (11.7 mm - 60 UNS-2) is compatible with other available makes of similar microphone preamplifiers. Preamplifier Type 26AH is provided with a 3 m high-quality cable terminating with a 7-pin LEMO series 1B plug. Noise (Linear 20 Hz – 20 kHz) max. Noise (Linear 20 Hz – 20 kHz) typ. Conditions: 23 °C Ambient temperature, ±60V/+120V power supply, 18 pF dummy microphone, 3 m output cable.